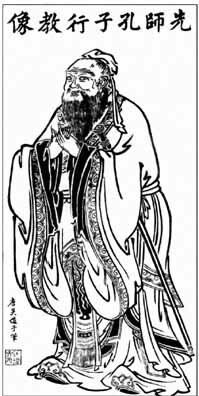 Confucius, most often referred to as Kongzi, lived c. 551-479 BCE. He was a famous Chinese thinker and social philosopher whose teachings and philosophy have deeply influenced East Asian life and thought. His philosophy emphasized personal and governmental morality, correctness of social relationships, justice and sincerity. In this seance, he explains that we cannot judge the inside of a person based on outward appearances. The seance recording is poor and the voice is difficult to understand. The situation is that whatever they may be able to give to you must be brought down to a level of understanding, otherwise you can only receive a very poor picture of the realities of which we are conscious, in as much that we are limited by the many conditions in which we have to communicate. With all the goodwill, all the desire to be co-operative never the less there are limitations which are set, like yourselves under the conditions in which you live. I come to advise and help you. I have lived on your plane centuries ago in China. I have been called by several names and I do not feel it would be an advantage if you were to know these names by which I was known. For a man who is wise (as you understand it) as soon as he passes through the gates called death, he realizes that , that which was wisdom in the past, as you progress becomes ignorance in consequence of the wisdom gained. Wisdom is something which is a state of being which may apply and does apply till such time as you have made progress to another state. That which was wisdom in the past becomes ignorance in consequence of wisdom gained according to ones knowledge, but that what was true yesterday still has elements of truth, is not so in the light of new knowledge. Knowledge is something which is ever changing. Movement is life. Man cannot remain stationary. Knowledge becomes ignorance through the light of new wisdom. Wisdom of yesterday is not wisdom of today because one has gained greater wisdom from experience. That is why when you come to us you have knowledge and wisdom to a point. It is only we who come to you who realize how hard it is to give you greater illumination that we would like to do. We strive to overcome complication and difficulty created oft times in ignorance. Great teachers, great leaders, full of wisdom and the centuries of time and then gather together knowledge of ancient wisdom and they call themselves wise men. Because it is not always factual, that which applied then no longer applies now, but is fundamental truth. We that come to you know that man will only find divine truth when he himself becomes spiritually attuned into the highest spheres and the greater souls that come. Oft times at meetings we have heard it said it is very interesting for me to communicate with this and that person. Sometimes we receive illumination. But always we realize that those of your world go groping in darkness, so do not perceive as we would wish them to do. Man cannot reach greatness in spirit, to higher wisdom until he has lifted himself above material things. You who go to these meetings, you gain here and there, knowledge of a kind. I do not despise this knowledge but you must seek the things of the spirit. Those who are themselves by nature, thought and action spiritual, the limitations are great and the difficulties are many. We cannot help to commune with higher evolved souls as you would wish, nor can we help to communicate with whom you may desire. Good souls, some not highly advanced, come to you with love and a desire to serve you and mankind, through you, but never the less they are limited as you are limited with all these conditions, conditions which are created by peoples of the earth. You must realize there is war in thought and war within themselves and against each other and it is because they have no sight, no trust, no realization the world is run by fear. Do you realize that in the world of spirit there are souls akin to yourselves who have not gained great enlightenment or great knowledge but who live together. It is true in a kind of world of understanding, tolerance and affection. They are not great souls in wisdom, they are not great souls in spirit, you understand, but they come to you for they are near the earth. They are not perfect beings; they are imperfect beings in process of change. They can tell you things which will interest you. But that world is not unlike your world but the things you desire from the higher realms of spirit cannot be given until you, yourselves, have risen to that higher vibration. I cannot attempt to describe the sphere on which I dwell for there are no words to depict these things. They can only be felt by the beings who are in tune with us. It is something within your soul which will come to you with a great realization and a great impact that is tremendous, when you are prepared and ready for it. Those souls who come to you and describe things which when you think on them, are like your own world. They say our world is wonderful our world is beautiful we have wonderful scenery we have our homes .. Our illumination there is beauty. .all this they say. You associate all this with goodness and loveliness. It is true, these things exist. There is a replica of your world.. The physical material world in all its beauty, all its co lour without the disfigurements that man has brought about, without all the things which create havoc in the hearts of man and in his mind also. They do not, at this stage, realize all the wonderful things that are ahead for then. There are other spheres of progress where it is impossible to depict in any shape or form such a condition of life, where they are not limited as you are limited. You cannot see these things; you cannot understand these things; you are not yet ready for these things. We are not in a world that is three dimensional. We are in a world that is four dimensional, which you could not possibly conceive or understand.. It is beyond your comprehension. I am conscious of your desire to serve and help others. One of these days you will realize that those who come to you are not so far removed from you. In other words they are souls who by their very nature are kind and considerate and who have made certain progress and they will tell you of their own condition, in their own environment, but you cannot hope to receive from the higher evolved souls. You must remember that all life is a gradual procession of stages and it is impossible for souls of certain vibrations to depict things to those on another sphere. We can send to you and receive from various souls, things which will help and are valuable but there are many things which you cannot yet perceive. Those who desire this knowledge will not find it until they, at least by their very nature and being, make it possible. However we hear people say this and that… .ask that question but they are not even ready for the elementary things. There are people in your world who have said that they have made direct contact with Jesus. I say that this is not true. Man must realize that he is put on to the earth world and he progresses as well to other spheres but all these different aspects of life are stages of development for gradual progress. Man must progress through stage to stage and, grasp in each one, knowledge. Knowledge is always fluctuating from condition to condition according to wisdom gained in one experience he finds in a new experience greater wisdom. All wisdom is part of the whole… .part of the complete. It is in this world, like steps on the rungs of the ladder which you climb. That child who stumbles and falters on the bottom rung is beginning, but cannot see how high and how tremendous and it takes great courage to climb gradually. Those at the top often find it hard to come down. We are conscious of the earth's needs of peoples’ desires. We realize that the majority of those who are so called spiritual are far from being spiritually minded. Oft times they are immersed in their own vanities, their own ideas, their own ideals and are not content for themselves but they want more and more. It is something to learn, to know that a little knowledge, well understood properly, helps very much to greater knowledge. There are those who have little knowledge who are vain and say they have all knowledge. Some start to open new societies, new Religious groups and bodies and attest to the world that they can contain all that is good and the others are bad. There is no religious body or organization in your world that can contain all truth. There are those who have a gleam of truth and they distort it with their own ideas and vanities. Even spiritual truth is often obscured by the vanities of man. He makes a great religious organization. He amasses wealth, fortune and great buildings and possessions. He becomes, as it were, powerful over the minds of souls and binds them and creates havoc in their lives and the real truth is obscured. I can think of many religious bodies in your world professing outwardly to be spiritual but are more material than the materialist who has no religion at all. Truth is something so tremendous that it should make a man free and make him realize that he gets part of the Divine plan. That he does not need ceremonies and the outward shows and material conditions to make him great. Man is only great when he is first humble. The more chance is that he will become spiritually conscious in your world. Those who seek high truths must remember it can only be found when you shed yourself of all material things which bind you down mentally and physically. Many souls come to you and I have listened to their voices. They are good souls. They come with intent to help. But remember that those who seek the highest must in themselves become like children. I remember the words of a great teacher suffer the little children to come unto me, for such is the kingdom of heaven. That was not only the parable of children who gathered around him, but the parable of children of all ages (0 to 1,000 years). All kinds of children of all colours and all races. If we become as children and come patiently with love and trust to our divine parent, we must realise we must be as children. We cannot enter into the kingdom of heaven( ? )which means you cannot enter into the wisdom, into the tremendous truths for you must have such faith and an open mind. Many who come to these meetings have not an open mind. They profess to have it. They are full of their own importance, full of their own pre-conceived ideas. Even those who preach from the platforms, who profess to be spiritually-minded are full of their own importance. Even the little knowledge that they have becomes twisted and distorted in such a way that it cannot give a true picture of things spiritual.